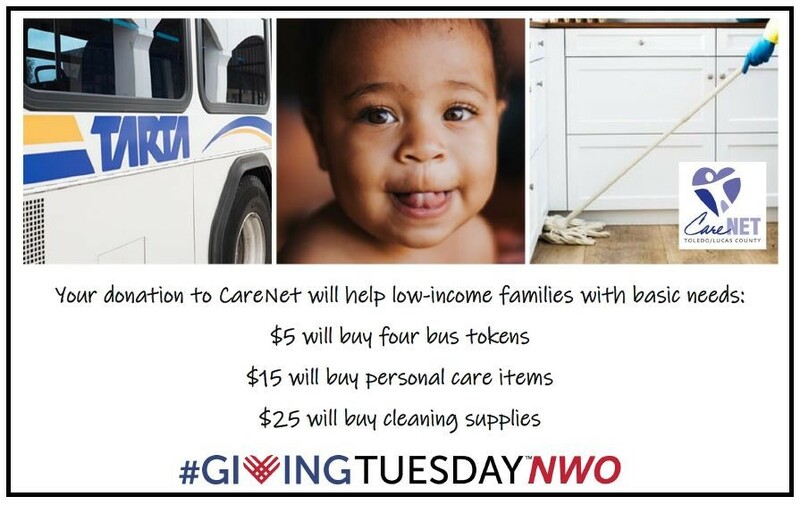 Toledo/Lucas County CareNet is participating in #GivingTuesdayNWO on Tuesday, November 27, 2018 to help raise money for our clients and their families as they work toward becoming self-sufficient. CareNet’s community health workers connect clients to needed medical and social services, including insurance coverage, food, transportation, clothing and other basic needs. To learn more about how CareNet has helped low-income Lucas County residents, please click here to read about Judith, one of our clients. Your #GivingTuesdayNWO donation will help provide basic necessities to low-income Lucas County clients and their families. A donation of $5, for example, will buy four bus tokens, while $15 will buy shampoo, soap and other personal care items and $25 will buy cleaning supplies. Click on the button below to make a donation, part of CareNet’s annual drive to raise $50,000 from individuals and businesses this year. Download, print and complete this sign, then share an unselfie photo with it and a link to this page. Be sure to tag @toledocarenet on Facebook and @Toledo_CareNet on Twitter.